At least eight people were killed and 11 injured after a driver barreled into a bike path and crashed a rental pickup truck into a crowd shouting "Allahu Akbar" in a Lower Manhattan "terror" attack Tuesday afternoon, law enforcement sources tell Fox News and The Associated Press. The suspected driver, 29-year-old Sayfullo Saipov, was shot by police and taken into custody, law enforcement sources told Fox News. Saipov remains hospitalized. According to The Associated Press, the suspect has a Florida license but may have been living in New Jersey. Four of the injured were teachers and students near Stuyvesant High School, who were riding on a short yellow school bus when they were hit by the suspect's Home Depot rental truck. One of the students remains in critical condition. One of those killed in the attack was a Belgian victim in Manhattan, Belgian Deputy Prime Minister and Foreign Affairs Minister of Belgium Didier Reyners tweeted on Tuesday. Mayor Bill de Blasio, speaking at a press conference Tuesday evening, called the incident "an act of terror." "This was an act of terror, and a particularly cowardly act of terror aimed at innocent civilians," de Blasio said. Governor Andrew Cuomo referred to the incident as a "lone wolf" attack, and added that at this point in the investigation, there is no evidence to suggest that there was a wider plot. Around the globe, cities have been on high alert regarding vehicle attacks. The Islamic State has been encouraging its followers to mow down people, and England, France and Germany have all seen deadly vehicle attacks in recent months and years. FBI officials confirmed to Fox News that they have agents responding to the situation "with NYPD." A bomb squad was also on scene examining a vehicle. Following the incident in New York, President Trump tweeted "looks like another attack by a very sick and deranged person. Law enforcement is following this closely. NOT IN THE U.S.A.!" The president later tweeted that his "thoughts, condolences and prayers to the victims and families of the New York City terrorist attack. God and your country are with you!" 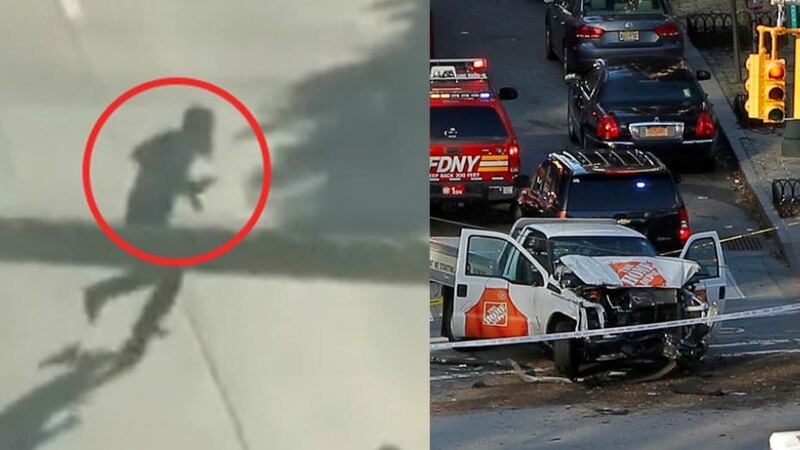 Police said the truck entered the bike path on West Street a few blocks from the new World Trade Center -- the site of the deadliest terror attack in U.S. history -- and plowed into several people. The driver jumped out of his rental truck carrying what turned out to be a paintball gun and a pellet gun. One witness who passed the scene while on the West Side Highway said he saw several people bleeding on the ground and a truck hit several people. Despite the attack, the city's annual Halloween Parade will go on as planned, with police "dramatically increasing presence," including "personnel, blocker trucks, long guns etc.," according to De Blasio's press secretary. He added the mayor will visit the parade area to "inspect the security upgrades along the route." If I was a second amendment freak I would ask. “Time to ban trucks now”. But the liberals still want more Muslims in . Trump's attempt to stem their flow was effectively derailed by them . Last edited by ashdoc; October 31st, 2017 at 08:32 PM. Trump's attempt to stem their flow was effectively derailed by them. says who? It was a temporary setback. Most Muslims are coming via family immigration (80% of immigrants are from family based), not employment based (most desis fall in this category). And there is no chance they will vote Republican, so it's not just about terror or demography. America is suffering from extreme political correctness. So far, after 9/11, USA was safe in a way. Now with the left wing in full swing, it looks like US will become a mess that Europe is today. Sad but inevitable, unless Trump is successful in stemming uncontrolled immigration from 'special peaceful' countries. Was the political correctness less 10 15 years ago? Is it a victory for the terrorists or a failure for the US to keep up with the safety measures for the times? It was there but far less rampant than today. Th PC guys are insane; I mean PC folks.